Carol was so sweet to work with! She sent me a gorgeous pink pendant to check out and I had to fight everyone off because everyone wanted it, even my little girls. It came packaged in a cute little jewelry box so it was like opening a gift when it arrived! If you love sparkle and shine like I do then you will LOVE this shop! People were ogling the necklace every place I went. The craftmanship is absolutely breath-taking. I kept inspecting the piece over and over trying to find a flaw and gave up. These are flawless, stunning, look great with a regular t-shirt or dressed up. I will definitely be back for more myself! Each glass pendant has a silver bail adhered to the back using a very powerful jewelry glue. It is so easy to slip on your favorite chain and out the door! Carol truly has a gift in her craft. Her pendants are a reflection of someone who takes great care in the art of glass. I love the glitz and glimmer in each pendant and adore the sun-catchers! You can purchase all sorts of wonderful trinkets at Glass Cat; from sun-catchers to pendants to wine stoppers, starting at $11.50! Carol is giving one super lucky reader their own gorgeous Shamrock pendant (pictured above) in their choice of adult-size or child-size!!! Go to Glass Cat and tell me one (or two or three or ten!!!) things that take your breath away! One comment only, even if you find half a dozen things you are drooling over! All opinions expressed herein are my own. I was not paid for my opinion. Thank you to Carol for providing the items for review and giveaway! Wow---she has quite the inventory! The coral sunset sterling drop earrings are unique and that shade of orange is so pretty! Ok, I've looked through more and everything is unique! I think that's one of the appeals of her designs. Makes it feel a little more special. The caramel sundae pendant is lovely--reminds me of a butterscotch. 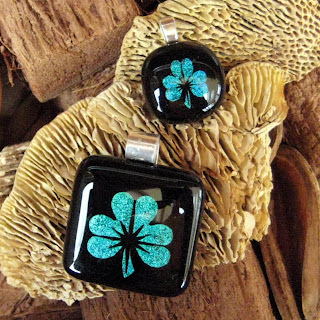 The shamrock suncatchers are also beautiful. I've got to stop...I could go on & on! 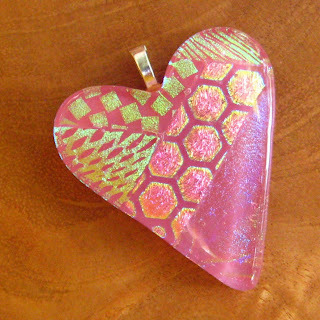 I like the Garden Time Dichroic Heart Pendant. I follow Glass Cat on Twitter. I fanned Glass Cat on Facebook. I like the Sunny Yellow Dichroic French Hook Earrings. I love yellow. Can't wait til Spring tulip-time, we had a wonderful dalmation, and I love to try to grow shamrocks, so those are close to my heart! My fave item ( and it was hard to choose) was the Dichro Tree of Life Pendant! Fanned Glass Cat on FB! aww. i love the Dalmation Puppy Suncatcher. it's so cute! I like the Shades of Blue Dichroic Glass Bracelet. I love the Dichroic Wine Stopper. I love the kitty in the garden pendant! I love the Holiday Shimmer Dichroic French Hook Earrings. I love the lemon yellow dichronic earrings! I grabbed the Green Girly Goodies button. I would love to get the kitty in the garden for my MIL. lovely creation sweetie. my fave are the following: Sunset Dichroic Bangle Bracelet, Blue Starlight Dichroic Glass Bracelet & the Dancing in the Dark Dichroic French Hook Earrings. 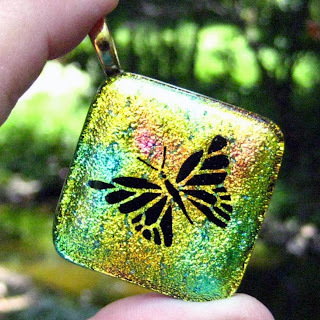 I really love the Dragonfly Dance Dichroic Pendant, its soooo pretty. Glass Cat and I are both on twitter! I love your Yellow Standing Butterfly. I love the yellow standing butterfly and the Rainbow in the Clouds pendant!